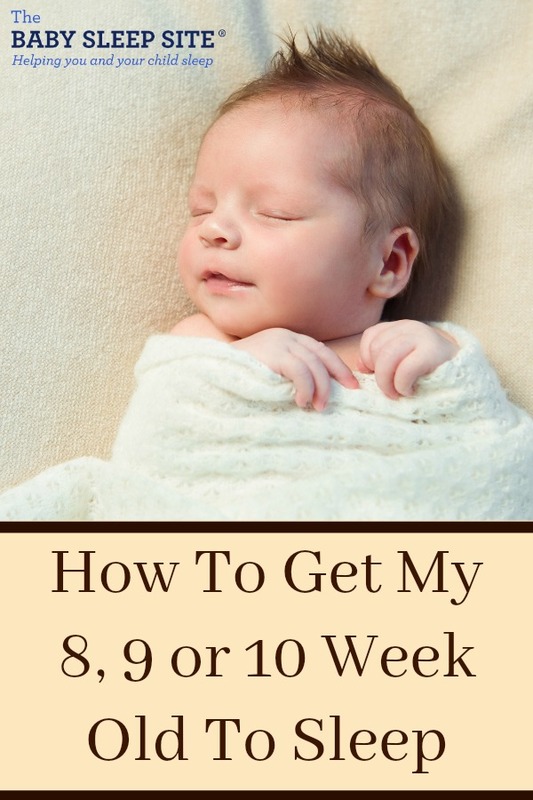 Let’s take a look at the 6 steps to help your 8, 9 or 10 week old baby sleep. In those first few weeks when all your baby did was SLEEP you probably wondered, “When will my baby start staying awake longer during the day?” And, now, you may be asking yourself, “When will my baby begin sleeping longer at night?” Whether your baby suddenly cannot nap anywhere other than your arms or wakes up frequently at night, you are not alone! And, we have the keys to getting your 8, 9 or 10 week old (and YOU) the best sleep possible! Setting the environment for sleep is crucial and part of cuing your baby it’s time for sleep is to have a consistent set of steps you do each sleep period, at night and at nap times. The sleep routine should be short and sweet at this age. For example, dim lights, close curtains, change your baby’s diaper, sing 1-2 lullabies, nurse or offer a bottle, cuddle the baby for a few minutes while burping, and then lay your baby down for sleep while saying a key phrase (e.g. “I love you. Time for sleep. Night night.”). The younger your baby, the shorter the routine should be. After all, 2 month old’s have very short awake periods and if we miss their sleep window, LOOK OUT! Don’t have a schedule yet? Now’s the time to start thinking about how to form a loose sleep schedule for your baby. It’s unrealistic to expect 100% consistency from your baby at this age, but you should be able to predict at least what time your baby will wake for the day (within 30 minutes plus/minus), when the first nap will begin, and perhaps bedtime. Families, depending on their situation, can’t always stick to a set schedule as well as others, but just do your best. What type of schedule you ask? Check out our sample schedules here or make your own custom schedule! If the previous steps haven’t significantly improved your 8, 9 or 10 week old’s sleep and you’ve downloaded our free e-Book, 5 Ways to Help Your Child Sleep through the Night, it’s likely your baby has sleep associations that need to be resolved with gentle sleep training. Ideally, you’d get a professional assessment of your baby’s sleep challenges, but if you feel certain a dependence on parental help is part of the issue, then you may want to consider gently sleep coaching your baby towards more independent sleep. This essentially involves helping your baby learn to fall asleep with less help from you – overtime and with plenty of reassurance and comfort from you along the way. Given your baby’s age and our experience, however, we do feel strongly this should be done using a very hands-on, gentle sleep coaching method which limits crying. If you’re considering gentle sleep training, you need to figure out what to do next. Some of us are planners and others simply “wing it.” If you’re not a planner, you can certainly skip this step, but if you’ve been trying to help your 8, 9 or 10 week old sleep for awhile now, you’ve developed a routine, reviewed the schedule recommendations for 2 month olds and plugging along without a set strategy isn’t working out so well, maybe a plan is just what you’re missing. After all, it’s hard to know how to get to where you’re going without a travel plan. Make the plan as detailed as you want it, but having a step-by-step plan helps you stay on track, committed, and consistent. Not sure where to begin or need help creating your baby’s sleep plan? Consider making your own sleep plan or letting us create a Personalized Sleep Plan™ for you and your baby. We hear everywhere that “it takes a village” to raise a child, but gone seem to be the days where we have a lot of help nurturing our babies. I don’t know about you, but my mom came out for one week when my first baby was a newborn, but that was about it. My husband and I were largely on our own. No Aunts to regularly hold the baby while I took a nap or enjoyed a (hopefully hot) meal. So, getting through this 8, 9 or 10 week old trouble spot can be tough without support. We sometimes have to recruit our own village. Consider hiring a sleep consultant or asking your partner, friends, or family members to help you implement your sleep plan. Having a support system in place can make all the difference in the world in reaching your sleep goals! Whether you’ve already made some progress getting your 8, 9 or 10 week old to sleep or you’re just beginning your research into helping your baby sleep, it’s important to never lose sight of “what’s next.” Why? Because babies are constantly changing! So be prepared and make sure you plan ahead, and have a game plan in place, before the next sleep regression or speedbump emerges. Around 4 months old your baby may experience their first sleep regression. What’s a “sleep regression” you ask? Now’s the time to begin thinking about how you’ll help your baby through any potential setbacks (teething, travel, and illness are BIG ones!) – sometimes the key to overcoming or even avoiding setbacks is understanding when they are likely to happen and having a plan in place for how you’ll get through them! So, is your 8, 9 or 10 week old sleeping? Or, maybe it’s time to learn how to get your 11, 12, or 13 week old sleeping? Wish I had seen this site before i started sleep training. Didn’t even know there was a gentle sleep training method. All the others, just say awake but drowsy, and all, but they never say how to sleep train a baby during certain weeks. I am sleep training my 10 week old baby, been doing it for 4 weeks now. Some days it works, some days it almost and other days, it doesn’t match. The issue I am having at the moment is that my son keeps fighting the 3rd and 4th nap of the day. So I tried to merge the two into one, so that he can wake the same times as the end of the 4th nap, but it’s a struggle. And it seems every week he keeps changing. Is there anything I am doing wrong, how can I help him not resist naps. P.s. I watch out for his sleep cues and try to get him down for a a nap as soon as I see the first yawn or the forst sign of fussiness. So why is it still a struggle? I’m sorry I didn’t see this comment before I just responded to your other one, but I wonder if you’ve seen our article with tips for 2 month-old’s? https://www.babysleepsite.com/newborns/2-month-old-baby-sleep-tips/ I think it may help with several of your concerns. Sigh. My baby boy is 10 weeks. He is amazing already hitting his milestone and even doing things for 3 months olds baby. There is the issue with sleep. I started sleep training him, well sort of getting him into a routine form 6 weeks as I knew I would be all by myself with no family help from 10 weeks. The first 2 weeks of trying was sort of ok. But then it seems every week it becomes a little challenging than the week before. I make sure I catch his sleep wi do a by watching out for cues, and then I risk did g a lullaby for naps with gentle pats on his back, and then use the PU/PD method to calm him down. Now it just seems it’s taking longer and longer. I even tried rocking to drowsy, and he still protests when I am about to put him down. Even when he closes his eyes, I gently say his name, he opens his eyes and then I lay him down, some days it works, and some days it doesn’t. It’s really challenging as I don’t know what each week will bring, and I am trying to be gentle in my approach and most importantly stay consistent. I want to help him sleep better, hence why I started early, so that if he does have any regression, he can pull through it. Please help me. I have a toddler who is almost 3 and also needs my attention. I don’t want to be cooped up all day attending to baby and letting my toddler feel left out. Good luck with everything, and hang in there! This post is very useful, I will follow the instructions to make my baby sleep well. Thanks for sharing!